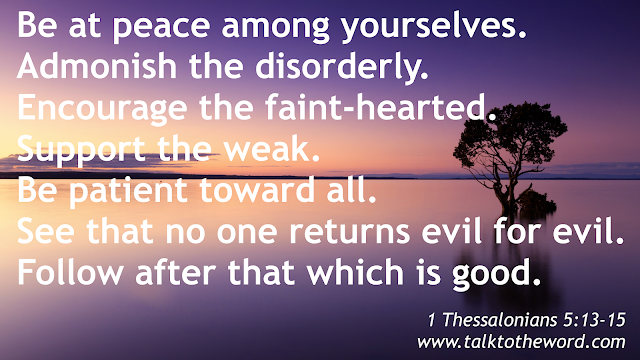 1 Thessalonians 5 [11.] Therefore exhort one another, and build each other up, even as you also do. But we beg you, brothers, to know those who labor among you, and are over you in the Lord, and admonish you, and to respect and honor them in love for their work’s sake. Be at peace among yourselves. 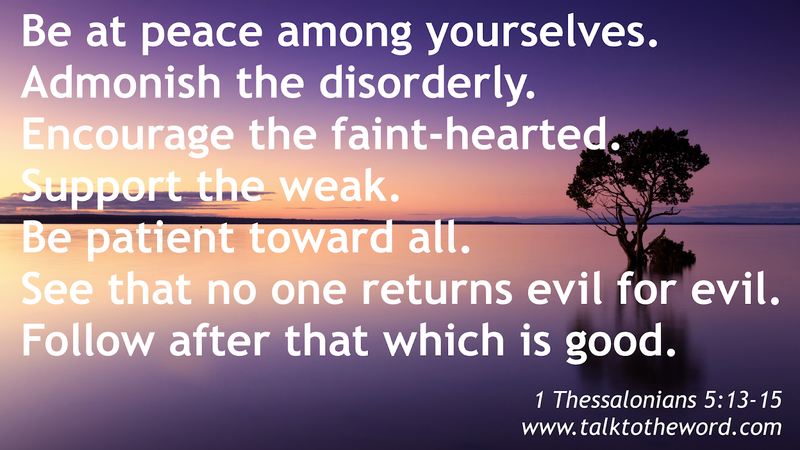 1 Thessalonians 5 [14.] We exhort you, brothers, admonish the disorderly, encourage the faint-hearted, support the weak, be patient toward all. See that no one returns evil for evil to anyone, but always follow after that which is good, for one another, and for all. 1 Thessalonians 5 [16.] Rejoice always. Pray without ceasing. In everything give thanks, for this is the will of God in Christ Jesus toward you. Don’t quench the Spirit. Don’t despise prophesies. Test all things, and hold firmly that which is good. Abstain from every form of evil.